Jacob's Crackers: San Pellegrino Best Young Chef 2015. A global talent search. Have you got what it takes to be the !! 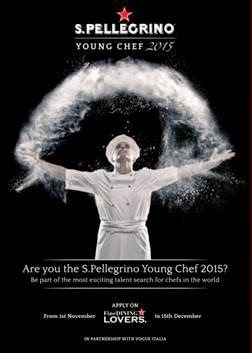 San Pellegrino Best Young Chef 2015. A global talent search. Have you got what it takes to be the !! San Pellegrino, ambassador of Italian taste and fine dining, launches a global talent search to find the best young chefs from all over the world. Open until December 15th, young chefs from all over the world can apply outlining their signature dish on www.finedininglovers.com, the online magazine for food enthusiasts, proudly endorsed by S.Pellegrino and Acqua Panna. The chefs must be 30 or under and working as professionals in a restaurant as chefs, sous chefs or chefs de partie for at least one year. All candidates will be divided in 20 regions according to geography. Thereafter , ALMA, the world’s leading international educational and training centre for Italian Cuisine ,www.alma.scuolacucina.it will select the first 10 finalists from each region according to five Golden Rules: ingredients, skills, genius, beauty, message. Between January 16th and February 28th, the 10 finalists from each geography will have to compete at a local heat before a judging panel composed of independent top chefs who will taste their signature dishes and choose the best one, according to the five Golden Rules. By the end of February 2015, the 20 finalist will be announced. Following on from previous collaborations with Missoni and Bulgari, S.Pellegrino announces a new partner in Vogue Italia, another iconic Italian brand that shares the same quintessentially ideals, including culture, togetherness, and beauty. The culmination of the talent search – the S.Pellegrino Talent Awards - will be on June 25th-27th in Milan, where S.Pellegrino will be the official water of Expo Milano 2015 and of the Italian Pavilion. At this event, the signature dishes and designs will be showcased and celebrated along with Vogue Italia. 1. INGREDIENTS: Successfully selecting the best of what the market has to offer with regards to quality, freshness and uniqueness. 2. SKILLS: Successfully handling and transforming raw materials into a finished dish that respects its original essence. 3. GENIUS: Successfully exploring ideas, inspiring, unexpected prospects/outlooks, connected with fine dining culture with a personal and contemporary style, while maintaining a perfect balance of tastes and shapes. 4. BEAUTY: Dish presentation is part of the charm. 5. MESSAGE: Successfully communicating a clear message through work and personal vision. Online applications must be submitted by no later than 15th December on www.finedininglovers.com. Follow the hashtag #SPYoungChef if you do not want to miss any update about the event.